“Let’s hide away everyone. Because then…. The FoI / DP gagging clause had never been used. I thought, given the Chief Internal Auditor’s recent finding of high priority fundamental risks in this area, and a failure to scrutinise and record anything, not only was I left scratching my head on how they’d provided figures for years 2006 to 2010, but the time had come to try and draw back the veil that’s been cynically pulled across, shine a spotlight into the gloom, and update the public on how many compromise agreements were issued throughout 2011 – a year of great turbulence for the Council. Compromise agreements are important and sombre legal documents, and often contain “gagging clauses” in order to keep the employee and the issuing body quiet. They rule out future legal recourse and are associated with the handing over of large sums of public money, aimed at pacifying complainants, whistleblowers (who can’t in law actually be gagged) or those who have been subject to disciplinary allegations or investigations. In other words ~ they are the lynchpin to an extremely touchy and sensitive area. Sharp-eyed readers may have spotted in the above report that David Garry, Chief internal auditor, has failed to highlight the subject of ‘compromise agreements’ in the introduction to the report, whilst making room for and headlining more mundane subjects such as “the overdue audit of Bidston Village Primary School”. So, on it goes despite Klonowski. The habitual kneejerk lurch towards the dysfunctional…. continuing ‘as abnormal’. The “Wirral Way” of doing things never bodes well for anyone banking on integrity breaking out, or ideals such as openness, transparency, and the free and unhindered flow of information. Maybe it’s just too early to usher in normality. And with no accountability in sight, maybe normality is a bridge too far? receipt for my request for review. 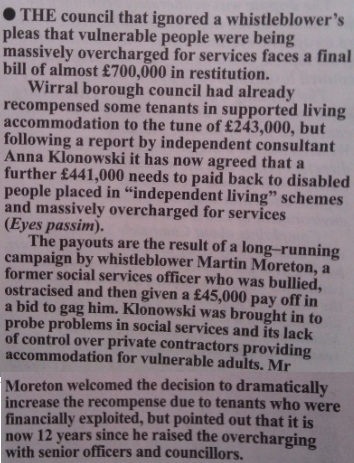 This entry was posted in FoI Requests, General and tagged abnormal, Anna Klonowski, chief internal auditor, compromise agreements, David Garry, FoI request, Gagging Clause, gagging clauses, high priority fundamental risks, total annual figures for compromise agreements, whistleblowers, whistleblowing, Wirral Council. Bookmark the permalink. It’s a funny one this John. They HAVE actually provided the info for years 2006 to 2010, although it took the best part of a year. How they managed this if there was no recording process for compromise agreements is beyond me. So I’m now asking them for 2011’s figures to bring the public record up to date. They haven’t refused this yet because they haven’t had a chance. But again, I assume because they will not have been recording them, it’s anybody’s guess as to how long it may take to get the info. If they fail to respond / fail to do an internal review / or breach the FoI Act again, I’ll go to the Information Commissioner and appeal there. It’s just a painfully slow process and very cynical of the council to put us through this – especially people like you and me who try to “engage in the democratic process”. Hi it would appear that I got hold of the wrong of the stick slightly but that’s not difficult with Wirral Council especially with the going’s on in recent time where they have been handing out compromise agreements & giant payout to senior staff who have perhaps not done their jobs properly or who have taken the money & run before they have been sacked.My only hope is that with the current senior staff who are being investigated get their just deserts & the “officers” who have taken Yacht club memberships,days at the races,expensive football tickets & £2000.00 golfing holidays allegedly get their just deserts as well Public servants should do exactly what it says on the label & not have their own private “gentlemen’s club” for their own benefit in Brighton Street..
Pingback: Wirral’s manipulation of meeting minutes. Has the Klonowski Report been buried over Christmas? « #FoILed again?